Courtesy of ARMEL REAL ESTATE INC. Please view our VIRTUAL TOUR to see ALL photos! It’s not just living, it’s a lifestyle! Tom Price Architectural design with Ray Coudriet as the Builder. 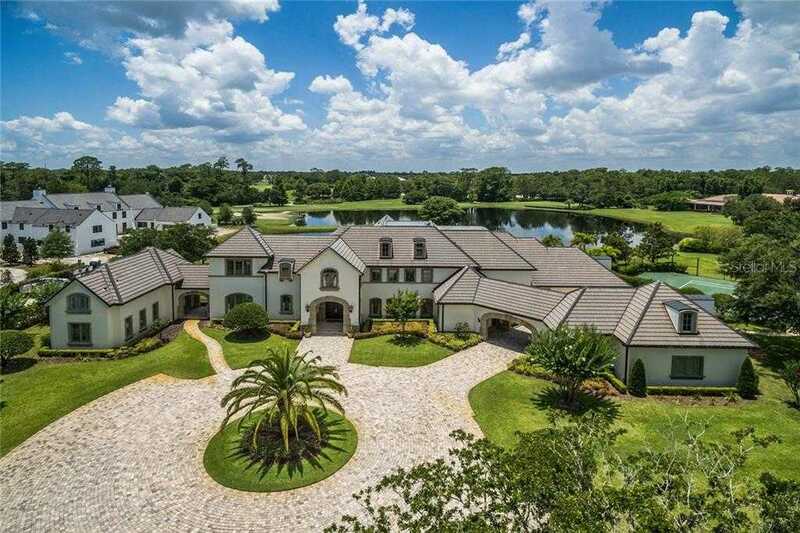 Come see this palatial estate of 8,986 SF (includes 7,714 SF Main House and 1,272 SF Guest House) located in the coveted Lake Nona Estates and situated on more than 2 acres along the par 3, golf hole number 13 of the renowned, Tom Fazio-designed, Lake Nona Golf & Country Club. This incredible property boasts its own private tennis court with pergola, basketball sport area, enormous pool area with covered gazebo and outdoor grill area, offering spectacular pond and conservation views along with the golf course. This property underwent extensive renovations in 2012 with 5 new AC units, upgraded stainless appliances, full interior/ exterior paint, complete kitchen renovation with quartz counters, butler area, 2 car garage conversion to Bonus Room, new carpet, all new toilets, sinks and fixtures, all new solid hardwood flooring, travertine entry and pool deck with pool re-surfaced. This home is spacious, grand and offers tremendous space for living and entertaining. Private balcony views from the Master BR and the upstairs living room wonderful spaces for peace and relaxation. The views from the kitchen overlooking the pool, pond and golf course are second to none. Community amenities include golf, fitness, tennis, boat ramp, racquet and pool. In the heart of Lake Nona, Medical City, USTA Headquarters, and minutes from OIA. Location! Restrictions: Please confirm restrictions with community Rules and Regulations. Please, send me more information on this property: MLS# O5776734 – $3,595,000 – 10205 Tavistock Rd, Orlando, FL 32827. I would like to schedule a private showing for this property: MLS# O5776734 – $3,595,000 – 10205 Tavistock Rd, Orlando, FL 32827.